We don't know what year this school house, located on Rt. 12 about where the fire station is now, was built but it was torn down after the new school was built in 1928 on Rt. 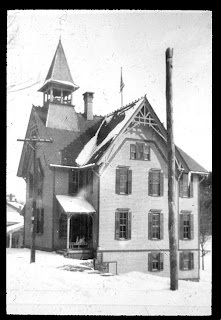 79, later known as the Chenango Forks Central School. The children played behind the school. When the new school was ready for occupancy the children packed their books and carried them down Rt. 12 and around the corner and up Rt. 79 to their new classrooms. Ruth Wiktorek, an 87 year old resident of Chenango Forks was a student there and told me about moving day. In the late 1930s the school was centralized and the first addition was built. This was the school I attended from first grade in 1943 to graduation in 1955. We had no kindergarten back when I started school. In first grade I wrote with both hands. My teacher was newly out of college and told me to write with whichever hand worked the best for me. I chose my left hand. My friend Bertha (Bert) was a lefty and her first grade teacher made her write with her right hand. Then there was Charlotte Kenyon who lived two houses from the school. Her husband LaVerne was one of the two janitors. They lived in a Montgomery Ward catalog house. I found a reference in the Whitney Point Reporter to the house materials arriving at the railroad station where it was hauled to the building site and put together by Mr. Kenyon. Charlotte was my second and third grade teacher. An excellent teacher, Charlotte was dismayed because I couldn't read to her specifications. In a short time I was reading ahead in my books and couldn't find my place when called on because I had no idea where the class was reading. Thank you Charlotte for teaching me to read. Every Wednesday night I go to the library with a bag of books and return home with another bag full. Charlotte had no children. She took needy children under her wing and bought clothing for them. After she finally retired, she went back to school every morning nearly until the end of her life to tutor children who needed special help. When we got to high school at the end of the year we had a picnic at Chenango Valley State Park. The school buses took the entire high school to the park in the morning and back to school in the afternoon. I can remember looking across Lily Lake and wondering what those couples were doing wandering off into the woods. Some of us girls rented boats and rowed around the lake. My family lived on a large farm about five miles out of town. The school bus picked us up every morning and took us home in the afternoon. So obviously I couldn't tell my children I walked five miles to school and back home again, both ways uphill. The administrators at ChenangoForks really trusted the seniors. We went on a senior trip to New York City. We went to the Hayden Planetarium, saw a baseball game and went to a Broadway play. Right now I'm listening to a CD of the music from that play The Pajama Game. Can you imagine there's a new project underway in the sewing room. At Triangle Guild last Thursday night President Judy hung a top she made. It was a beautiful scrappy bargello with a pioneer braid border. I sat sketching the layout when she came by and whispered in my ear Quiltville.com. Of course you know the next morning I started cutting 16" strips 2 1/2" wide. Now I have four strips sewn in their final order. This will be a small quilt, just lap size.